Roundtable Contributors: Elizabeth Caran (Outlander Travel), Estelle Hallick (This Happy Place), Alan Mize, Blake Taylor (BlakeOnline.com), Andrew (Disney Hipsters Blog), and yours truly. Newly designed guide maps appeared at Disney World this week, the first major re-design in a few years. In addition to the new information provided the general 'look' of park landscape has been drastically revamped. For those of you familiar with the My Disney Experience app, these new maps have a very similar look. Much more sleek and less convoluted than before, I find the new layout very practical for day guests... though the photos and information section can get a little jumbled. One thing that seems a little strange is the exclusion of the new "Tangled toilets" soon to appear in Fantasyland... strange. I am very vocal when it comes to accessories. I've passed on the Dooney and Bourke bags because, for the money, I won't be using them much when not in the theme parks. If you want to call cosmetics an accessory (and I think you can), I can't imagine pulling out a Beautifully Disney lip gloss in the middle of happy hour in New York and being taken seriously. 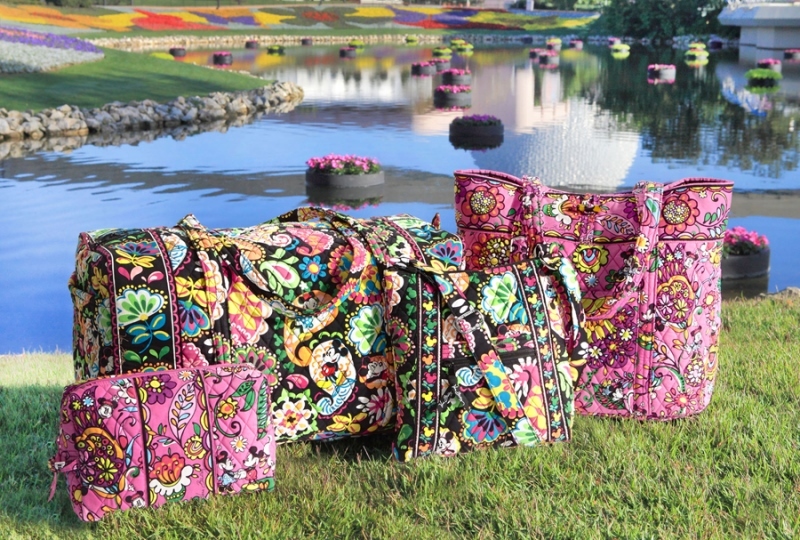 But, I'm here to say: I like the "coming soon" Vera Bradley collection. Like the recent LeSportsac partnership, Vera just makes sense. Her designs are bright and busy already and the addition of Mickey Mouse isn't jarring. Plus the material is washable and as a bag, Vera is more affordable than the other "designer" options. I'm not sure why Disney feels the need to pair up with all these big names all of a sudden. Frankly, it's starting to feel like too much too soon but I have to applaud this choice. While Vera's style isn't for everyone (I mostly use these bags for traveling), I'm looking forward to seeing them down in theme parks. This week, the Disney Company released a new game for the iPhone/iPad/iPod called Toy Story Smash-it! It has a $0.99 price tag on it and I generally am not one to spend money on a game when there are tons of great mobile games that you can get for free, but I took a shot on this one and I am glad I did. This is an incredibly fun game. It’s a physics based game similar in concept to Angry Birds, but in this case you’re playing as Buzz Lightyear and you’re launching the Pixar ball at the little green aliens from Pizza Planet. As the game progresses, new obstacles, weapons, and techniques are introduced which prevent the game from getting stale. It is a truly addictive game as well. I downloaded the game, and within days, I had completed all four of the current levels and achieved the perfect score for each level. At this point, I am eagerly awaiting an update so that I can continue playing this game. This is one of the best purchases I’ve made for my iPad and if you’re an owner of any Apple mobile devices, I highly recommend you give this one a try. 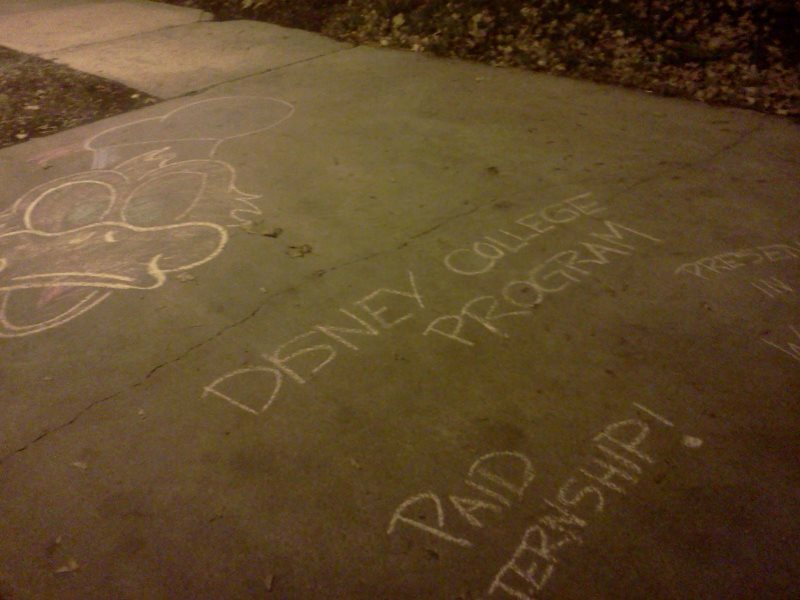 The Disney College Program will no longer offer on-campus presentations to promote recruitment. The program, first began in the '80s, offers college students the opportunity to intern for a semester as a Disneyland or Walt Disney World Cast Member, earning course credit for their work and taking optional Disney-geared classes. Up until the current spring 2013 semester, 45-minute presentations held on campuses across the country highlighted what the DCP was all about for interested students. Now, Disney will focus more of its attention instead on things like information tables in campus common areas that can refer students directly to the application website. The news comes from Cast Member representatives at such an information table at my school when I asked them when the next presentation would be. I'm a bit surprised at this decision, partially because the presentation I attended in the fall did an excellent job at summing up not only the College Program itself, but also the benefits and opportunities it can lead to. My friends who attended the presentation weren't aware of the potential doors that can be opened in career areas like recreation or broadcast journalism if the DCP is on their resume. That reason for participating as a Disney intern—to build stepping stones to a broader career—is something I felt that the presentation really drove home better than the website. No matter, with or without info presentations, the DCP will still get the word out. More booths and tables means more built-in Disney background music... which consequently means I know where I'll be studying more often. Avengers Assemble! After the announcement that Disney acquired Marvel many moons ago, many many Disney fans (myself included) were hoping the Avengers might assemble in Walt Disney World in a new themed land somewhere. Heck, we would have even been happy with Disneyland. And last Wednesday, at long last, Disney finally announced plans for a Marvel-themed land. At Hong Kong Disneyland. I mean, it's great, really! Hong Kong is the smallest of the parks and has a real need to pull in more visitors with more money. The new additions of Toy Story land and then Grizzly Gulch have been well-received and those alone are enough for me to pine to visit the park. Soon, they will introduce their own twist on The Haunted Mansion, Mystic Manor in the new Mystic Point land. However, HKDL is still the smallest of the parks and to compete with the nearby (because everything in Hong Kong is nearby) mountaintop Ocean Park, bigger is better. (If you aren't familiar with Ocean Park, Google some images. It's really something else). So, I'm happy for Hong Kong Disneyland. Really. I'm very happy. But, you know... couldn't we have at least a S.H.I.E.L.D. walkthrough or something? Maybe a boutique where you can get your own eye patch and scar. Or they can make you look like Scarlett Johansson! Or better yet, they could make my wonderful spouse look like Iron Man? Please? Pretty please? In previous years, the Epcot International Flower and Garden Festival has had food available. You know, that little snack bar inside the Festival Center? If you don't remember it, don't feel bad, it was never that busy. 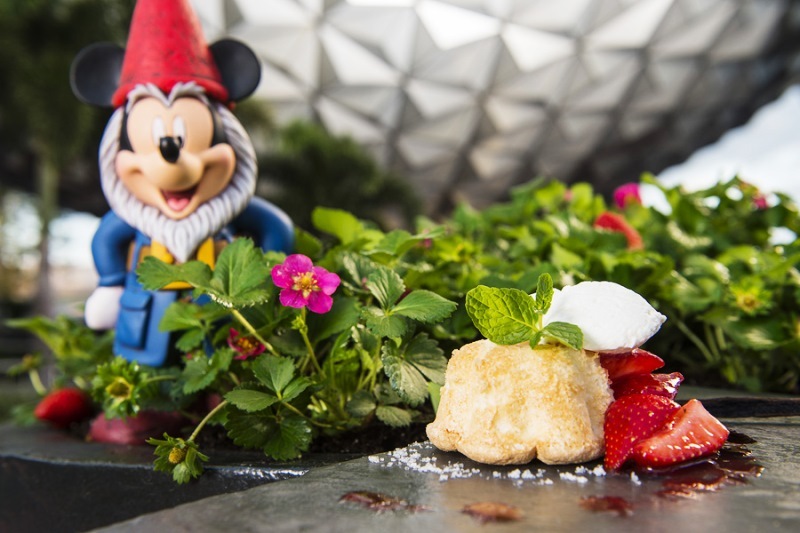 This year, however, Epcot made the decision to highlight have things grown in the garden can be infused into menu items that are delicious to eat and drink! I'm sure you've heard of the Dole Whips floating in some spiced rum, especially since the lines were ridiculously long to try one of these limited time treats yesterday, but that's not where the story ends. All-in-all there are twelve marketplace kiosks scattered about Epcot featuring items from tomato salads, spring pancakes, candied strawberries, smoked brisket, a frozen violet lemonade, and much more! Sure, I'm having a hard time saying the name without calling it the Food and Flower Festival, but that doesn't mean I'm not thrilled about the influx of food for the festival. During the Epcot International Food and Wine Festival each fall, the gardens are just as gorgeous as they are in the spring, so why not bring food that is just as delicious to the spring? Sure, this could be seen as the homogenization of the festivals, but I'd like to think it is simply a way to highlight all of the things that come from the gardens. Food and flowers also happen to be two things that Epcot does as well as anyone!